The 2009 “Celebrity Hairdresser of the Year” in the UK, Tara Smith’s hairstyling talents are in demand by movie stars and fashion magazines in the UK and the US. She has developed a range of vegan hair care products to bring a new approach to the hair care market. Tara’s belief that “what you put on your body is as important as what you put into it” has led her to develop products that are free of harsh chemicals and committed to ethical vegan standards that reduce environmental impact and exclude all forms of animal cruelty. Using the slogan, “Tested on film stars, not on animals”, Tara Smith products are authorized by The Vegan Society, a charity that promotes a lifestyle excluding all forms of cruelty to animals, and The Leaping Bunny, a corporate standard that says a product will be 100 percent free of new animal testing. Tara Smith hotel amenities are selected from popular retail items which include Shine On Shampoo and Conditioner, Wash Up Shower Gel, Soften Up Body Lotion and Clean Up Soap. 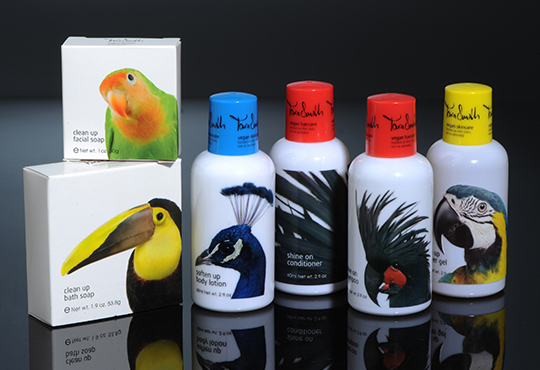 They feature bold animal print designs and contain natural plant and flower extracts with soothing fragrances.